These little “Protein Pots” are new in the snack chiller cabinet alongside the sandwiches and drinks. 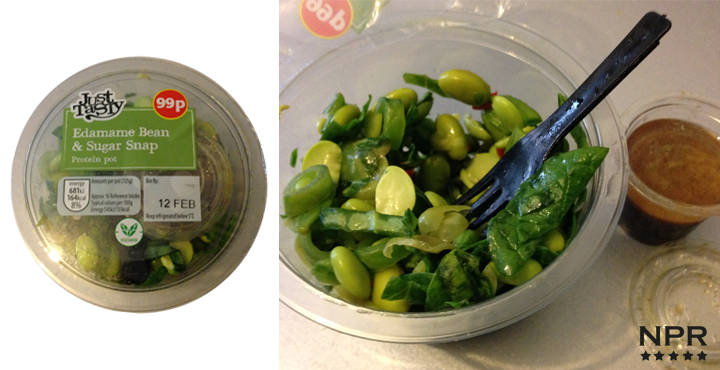 They contain Edamame Beans, Sugar Snaps, Spinach and Red Chilli and come with a small pot of Ginger Dressing, a fork and contain over 9 grams of protein. Edamame Beans(48%)(Soya), Soy and Ginger Dressing(20%)(Rapeseed Oil, Soy Sauce[Water, Soya Bean, Wheat, Salt, Alcohol], Ginger Puree, Water, Rice Vinegar, Sugar, Roasted Garlic Puree, Cornflour), Sugar Snap Peas(18%), Spinach(10%), Red Chilli, Rice Vinegar, Rapeseed Oil. Just had my first protein pot and have to say it was so delicious! I really enjoyed the taste and texture, I will definitely be buying more! I agree with Sally. Ignore the review above. These protein pots are delicious. The reason i ended up on this review is because after eating my first pop I was hoping to find the ingredients so i can make something similar in bulk. Yay Sally, I agree! and with DAB’s reply. I do feel a little bit expensive though. 4 star taste, health and quality, 3 star cost, 5 star buy again. I agree with Sally and Dab, I’ve just eaten my first pot and loved it. (however, I didn’t bother with the dressing). Portion size was perfect and the chilli gives it a welcome kick. These are great! There is maybe a little too much dressing, but overall top marks! Had one of these today. The review in the article itself doesn’t do the product justice. Little pot of tasty heaven. Great flavour with the dressing which I enjoyed down to the last mouthful. The beans need a good bit of chewing as they’re al Dante / crunchy, so this makes the pot last quite a while so you’re feeling really satisfied by the time you’ve finished it. It certainly has got a kick! I probably wouldn’t put all the dressing on next time. Very filling for a quick lunch. It would be good if someone worked out the Slimming World syn value of these-with and without the dressing. Don’t listen to the review these little pots are yummy! Try them with some warmed spicy Moroccon Falafel, (also from Aldi) for a fab quick lunch! absolutely delicious and the dressing is just right ,perfect for a vegan like me i love it. I love it. I’d give it 100%. Pity it’s not a tad cheaper.